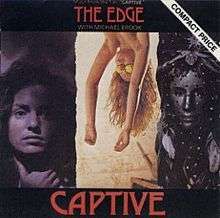 The soundtrack for the 1986 Anglo-French cinema film Captive is the only solo album to date by The Edge, guitarist of U2. It is also the only solo album to date by one of the members of U2. The Edge approached Michael Brook, creator of the Infinite Guitar, which The Edge regularly uses, to collaborate on this soundtrack album; Brook co-produced and helped with the instrumentals and some of the writing. Edge also approached a young vocalist just beginning to appear on the Dublin scene to provide vocals for the main theme. This was Sinéad O'Connor, who would shortly afterwards release her debut album. She and The Edge's U2 bandmate Larry Mullen, Jr. contributed to "Heroine", with O'Connor providing lead vocals and Mullen providing drums. The music on Captive is a mix of ambient styles. The majority of tracks, except tracks 2 and 4 are instrumentals. The track "Heroine" was released as a single. All tracks written by The Edge except where noted. Lesley Bishop – French horn on "Rowena's Theme"
Larry Mullen Jr – drums on "Heroine"
Sinéad O'Connor – vocals on "Heroine"
Steve Lillywhite – remix of "Heroine"
↑ "Captive > Overview". Allmusic. Retrieved May 8, 2010.